This report is a study into the wave of paramilitary violence that swept the mining region of the northern Colombian Cesar department between 1996 and 2006, the effects of which reverberate throughout the region to this day. The report deals with the alleged role of the US-based coal mining company Drummond in this violence, and to a lesser extent that of Prodeco, a subsidiary of Switzerland-based Glencore. Both coalmining companies are selling a major portion of their production (roughly 70% in 2013) to European energy utilities such as E.ON, GDF Suez, EDF, Enel, RWE, Iberdrola, and Vattenfall. The study was conducted at the explicit request of the victims of the violence and their family members; and with the report we hope to contribute to their endeavours to uncover the truth behind the violence and achieve effective remedy for the harm they have suffered. Over the past three years, PAX has carried out numerous interviews with victims of human rights violations, former paramilitary commanders from the region, former employees of the mining companies and their contractors, human rights lawyers, and the Colombian authorities. A considerable part of the report, however, is constructed around court testimonies and depositions. We have used the testimonies of seven ex-paramilitary commanders, three of Drummond’s former employees and contractors, and one Prodeco ex-employee. They made their statements under oath within the context of the Colombian Justice and Peace process, the ordinary Colombian justice system, and in the course of a recent US court case against the company under the Alien Tort Claims Act. Multiple sources allege that particularly Drummond, but also Prodeco, have been involved, in various ways, in human rights abuses during this period. paramilitary violence caused more than 59,000 forced displacements in the Cesar mining region. In the early years of their operations, Drummond and Prodeco were well aware of the brutal methods used by the AUC to fight against the guerrillas and suspected guerrilla sympathizers. The government registered human rights violations occurring in the region and, as was confirmed by former mining security officials, the security departments of the mining companies actively collected data on security incidents and the activities of illegal armed groups. Local army units moreover exchanged intelligence information with the companies on an on-going basis. We did not find any indication that the mining companies at the time urged the Colombian government to take steps to prevent the gross human rights violations in the region.On the contrary, according to a former Prodeco military intelligence officer, the security departments of both companies played a crucial role in establishing the first contact between AUC paramilitary forces and company executives at an early stage in 1996. This contact allegedly led to the arrival of a first group of one hundred combatants to operate in the mining region. This was confirmed by an ex-paramilitary commander in the region who has claimed that the Juan Andrés Álvarez Front was created in 1999 upon the request of Drummond, specifically to defend the company’s mine and railway operations. general paramilitary strategy in the mining region with AUC commanders, for example to prioritize operations to focus on particular localities along the railway line. Three sources have testified that the private security company used by Drummond contacted the AUC directly if they saw a suspicious person and that the AUC organized killings on the basis of this telephone contact. 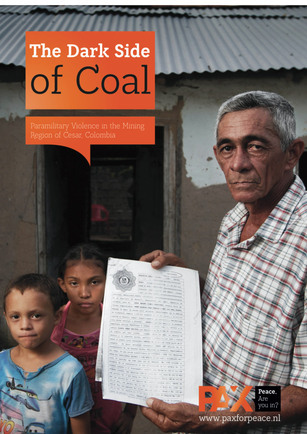 human rights and the social and environmental impacts of coalmining. Both Drummond and Glencore firmly denied the sworn statements of the ex-paramilitaries, exemployees, and former contractors regarding their companies’ alleged support of the paramilitary AUC in the region. An extensive summary of the reaction of Drummond and Glencore to thetestimonies can be found in Chapter 9. The cycle of violence in theCesar mining region has not yet ended. Today, the territory is plagued by criminal bands composed in large part of former members of paramilitary groups. Apart fromtheir criminal activities, these illegal armed groups intimidate all those among the civilian population who demand truth, justice, reparation, and land restitution for victims of the paramilitary violence. In several of their written threats and public communications, these groups have declared that they are acting as the protectors of the interests of the mining companies in Cesar. However,as in the recent past, the companies keep silent about these disturbing developments and have failed to publicly distance themselves from the aforesaid statements. PAX endorses the belief of the Cesar victims’ movement that the prevention of future human rights abuses in the Cesar mining region can only be achieved when the legacy of past injustices is satisfactorily resolved. It is time for Drummond and Prodeco to provide for, or cooperate in, legitimate processes to remediate the alleged human rights impacts of their mining operations. This requires them, by themselves or in cooperation with other actors, to actively engage with the victims of the paramilitary violence in the mining region in an effort to remediate their scars from the past. Such engagement could contribute to uncovering the truth about an important episode of the Colombian conflict, and it may set an example for mining projects in other parts of the country.